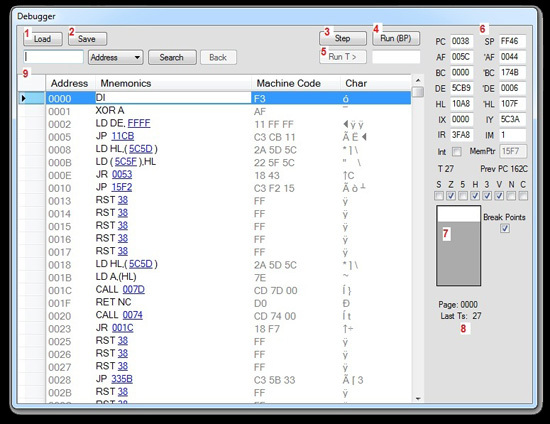 The debugger allows you to view the current state of the Spectrum, Including the memory contents, CPU Status, and disassembled machine code. 7 - Break points, Type any 16bit address in HEX format 1 entry per line, and enable the Break points by checking the box, When the memory address is reached the debugger will reopen. Press delete to remove the item. "T" is the current Tstate of the Spectrum. "Prev PC" is the last 16 bit address the Z80 fetched the OP from.